Developing has always been a challenging task for all fragmented environments; it’s hard to find an application environment that is as fragmented as the mobile zone though. While the world-known creations of Apple Company iPhone and iPad are coming into the limelight, share of the mobile market of Apple is less than 10 %. Users are dispersed between Samsung, LG, Motorola, RIM, among other providers. This definitely appears to be a real headache, if you want your app to get into as many hands as possible. As an example, if you decide to develop for Android OS and have at least a rough idea about how the application will look like, you can make use of shipped with Android SDK generic emulator. But have you any idea of how apps will be performing on the variety of devices such as HTC Incredible or Motorola Droid having their special feature? Not long ago, Netflix, an American video rental provider, faced this problem which became the reason for delaying company’s Android launch. According to Netflix the strategy of working with each of the handset manufactures is ineffective and will result in the fragmented experience on Android, where not all of the handsets will get access to Netflix. So the important thing is that there is not only one mobile zone, but in truth lots of splits across multiple devices, systems and networks. And it is difficult to test and deploy across them all. 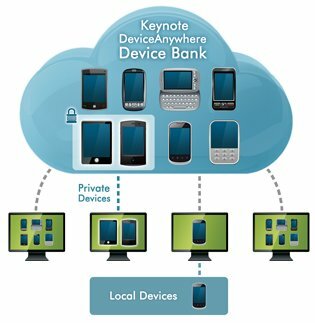 DeviceAnywhere can offer developers the clue on running tests across each of main devices and gives an opportunity to see exactly the experience of the end user on each device. Among the companies that have already tested their mobile apps are Amazon, Disney, Walmart and some others. So how does this clue operate? The DeviceAnywhere staff has succeeded in hard-wiring the in(out)put of each of main devices up to the server. When a developer uses their client software, accessing a device, pushing buttons, taping touch screens, simulating open, close and flip activities, removing the battery and even having the video and audio feedback from the device in any place around the world are in his disposal. Phones are not the only prerogative of the service. Besides, DeviceAnywhere is keeping up with the expansion in tablet devices, for example you are even able to control the Apple iPad using the software. It also expects to draw attention and interest to this area after showing to the public a great number of tablets at the last Computer Electronics Show. Tests can be automated/scripted/scheduled to interval run, besides complex intercommunications including multiple devices, data-driven scripts, and branching/looping logic are supported. Thanks to the fact that servers are located all over the world, developers will be able to find out how their applications perform in dissimilar locations. “Now there is no problem in testing on more devices and in more locations, where it wouldn’t have been profitable and useful before DeviceAnywhere. Fruit of this work is Quality Assurance program that has become more healthy and effective than before. It is also good news to reveal having considerable cost-savings as we don’t need to maintain a large group of mobile devices for testing any more”. Integration of DeviceAnywhere and Rational Quality Manager allows developers to exercise their apps on genuine mobile devices from within the rational environment. RQM tracks all kinds of test results on mobile devices and you can see these results through its interface. This can prove useful to you especially in case you develop across lots of environments – for example if you’ve got an application with a mobile and web interface. real-time alerts, failure notifications and Service Level Agreement cheatings. With such technology, you are able to reveal issues with the delivery of mobile apps before the users do and decrease downtime.